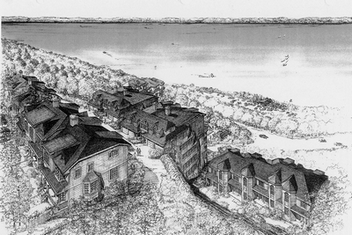 24 hillside condominiums with panoramic views of the Hudson River and Palisades. Six different models include luxury townhomes and single level maisonettes in midrise buildings set into the steep hillside with hearth/family rooms, deluxe kitchens and beautiful solariums. Outdoor pool with cabana. Entire site was stabilized with innovative combination of soil cement and geo-fabric. Site development planning by John K. Karhu Architect P.C. Awarded The National Association of Home Builders (NAHB) Best in American Living (BALA) Gold Award for Best Suburban Smart Growth Neighborhood/Community nationally.